History of the Present, launched in 2010, is devoted to history as a critical endeavor. 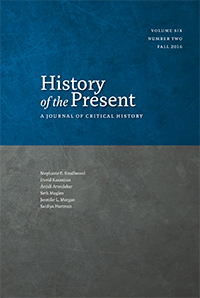 Its aim is twofold: to create a space in which scholars can reflect on the role history plays in establishing categories of contemporary debate by making them appear inevitable, natural or culturally necessary; and to publish work that calls into question certainties about the relationship between past and present that are taken for granted by the majority of practicing historians. In 2012, the Journal was awarded “Best New Journal” by the Council of Editors of Learned Journals. While the editors of HOP continue to curate exciting content, they have recently put together an exceptional special issue. The editors identified a group of contributors, who received the following prompt and were asked to submit essays. The issue’s contributors include Anjali Arondekar, Brian Connolly, Marisa Fuentes, Saidiya Hartman, David Kazanjian, Seth Moglen, Jennifer Morgan, and Stephanie Smallwood. This exciting issue is available now on JSTOR and in print. You can also purchase a single issue copy. We hope you will take a look!